Hong Kong is one of those places that is really hard to capture in a photograph. It is the perfect mix of modern and new, Hong Kong-esque and Western. You can find a brand new Starbucks next to an old family-run business. You can find pure luxury in the Peninsula or slum it at Chungking Mansions. It's hard to capture the city in photos, but here is our photo diary of our recent trip to Hong Kong. A typical street in Hong Kong. Hong Kong is a huge mix of Chinese buildings mixed with Western shops and hotels. While I love Hong Kong's likeness to NYC, I love the Chinese buildings and signage too. The contrast really makes Hong Kong something special. And in stark contrast to the previous picture, a snap of Hong Kong's concrete jungle. Everywhere you look you are surrounded by skyscrapers in every direction. It is one of the things that makes Hong Kong so special and it really awe inspiring as you stand on the ground and look up at the concrete jungle around you. Victoria Park was hit hard by Typhoon Mangkhut and there were trees and debris all around the park. These two beauties sparkles amongst the fallen trees. In such a busy city, filled with people and surrounded by a concrete jungle you'd think it would be difficult to find a moment of solitude, but the parks in Hong Kong provide a quiet space amongst the chaos of the city. I really love how they utilise their parks to get outside and explore. They are always so full with so many different people of all ages and activities going on. The problem with travelling together is that the only way to get a photo together is by taking a selfie. Selfies are never flattering! This was the one area of Victoria Park that had been cleared of all of the fallen trees and debris. There's something special about sitting in a park surrounded by tall buildings, it makes me feel so small and the city seem so very big and incredible. There are many temples in Beijing but the Man Mo Temple is definitely one of the most beautiful. The Man Mo Temple was another place that was hit hard by the typhoon.. There was construction and danger tape all around the temple as they were reparing it, but it was still incredibly beautiful. We stumbled upon Hollywood Road Park by accident when visiting the Man Mo Temple. We drove past it and I noticed it out of the window and so we walked back along the road to visit it when we got off the bus and I'm so glad we did. It was one of my favourite parks in Hong Kong. The park was all decorated for the Moon Festival, with lanterns all around the park. I love how colourful all of the decorations are - just stunning! Yet again, this park is in the middle of the city, surrounded by huge buildings but is so peaceful and serene when you are inside. It was the most stunning place, with temple style buildings and Chinese decor all around it. I highly recommend taking some time visit when in Hong Kong. The tram to the top of Victoria Peak was an experience ijn itself. It was really cool and the views were incredible as we were going up. At some points we were almost verticle and I was genuinely wondering how the tram was going to make it to the top, but we made it. And the views were incredible. The AQI was around 100 when we were there so there was a slight mist across the buildings, but we picked a pretty good day to go really. On one side you could see mountains and the other was filled with the water and skyscrapers of Hong Kong. We walked all the way around to get a view of both. Simply the most incredible view. I would have loved to have seen sunset here but I got my timings wrong and we ended up there way too early. By the time we got back down though, the queues of people heading up for sunset made me glad we didn't stay. On the tram heading back down the mountain. It is seriously worth this trip just for the tram, never mind the views. We visited Hong Kong's seaside town, which was a part of Hong Kong we have never visited before and absolutely loved it. It's so different to the city and Stanely had such a cool vibe. You would never have known you were in Asia in Stanley, you could have been at any Western seaside village. But the shops, temples and markets still kept that touch of Chinese culture and architecture. All the way along the boardwalk were lots of shops and restaurants, ranging from Chinese-style markets to typical Irish pubs. And the views were absolutely stunning. It had everything - mountains, seaside, skyscrapers and pure beauty. I absolutely fell in love with Stanley and could quite easily have spent the full day here if we'd had the time to spare. If you have time, I would definitely plan to spend at least half a day exploring Stanley. Repulse Bay was very different to Stanley but equally as cool. The vibe was brilliant, chilled out music was playing along the boardwalk and there was a huge range of restaurants. We got a wrap from Nood and it was amazing! It had a very Western vibe. The views around Repulse Bay were stunning. The sand was very pebbly so not the best to lie on, but the views were just stunning. The beach was surrounded by mountains and high rise hotels. Aberdeen is Hong Kong's fishing village which is worth checking out. It's quite run down in some places, and very different to the other seaside areas but it's cool to view the life of a fisherman in Hong Kong. We took a Sampan ride around the harbour and to the famous Jumbo Floating Restaurant. The Sampan ride probably wasn't worth it in all honest, but it was good to see the harbour in more depth. The Sampan was really old and cobbled together. I loved the authenticness of the boat, with the Chinese carpets and lanterns hung around it. The Star Ferry is a must do when in Hong Kong. It offers the best views of the Hong Kong Skyscrapers, probably the best in the city. The ride from Central Ferry to Tsim Sha Tsui takes around 10 minutes. We wandered along the promenade at Tsim Sha Tsui for a while. It's a beautifully developed area that has lots of little touches that make it special, such as entertainers, beautiful buildings, etc. There was a little old man singing and dancing, and he was terrible, but it was the cutest thing! 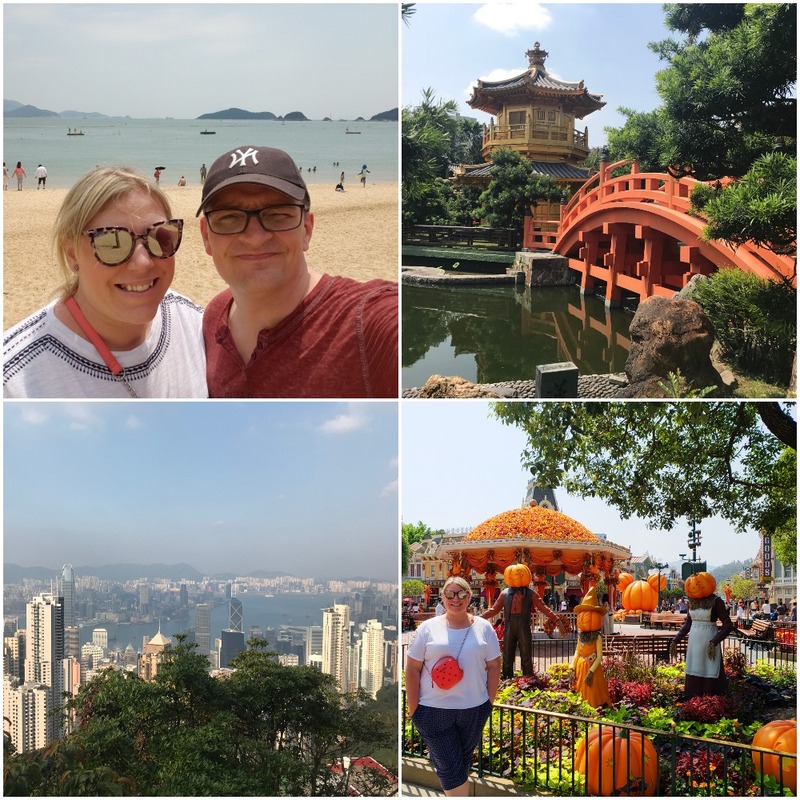 We didn't explore Kowloon too much as we have stayed in this area the past 2 times we have visited Hong Kong so we wanted to see the other places. Nan Lian Garden is a little out of the centre and so worth the trip. It's simple beautiful. It is a place of absolute peace and tranquility in one of the busiest and craziest cities in the world. There are beautiful stones, waterfalls, trees, flowers and temples all over the garden. They havemini museums to showcase each of these things, including Chinese architecture, showing how they were all built. The Temple is definitely the central focus of the garden, but there are so many other beautiful things to see and explore. You could easily spend a whole day relaxing here. I was so excited to visit Hong Kong Disneyland. I've been before, but when can you not be excited for a trip to Disney? I have to be honest, out of all of the Disney parks I've visited, Hong Kong is my least favourite. It is great for shows and parades, but not so great for rides. It is definitely much more geared to younger kids. The Flights of Fantasy Parade. Disneyland was all decorated for Autumn and Halloween which I LOVED! I mean, a Mickey pumpkin?! Is this not the most Autumnal decoration you've seen in one photo? I absolutely loved the Autumn vibe! When your selfies completely fail because you're standing right in the middle of the incredible Mickey flower display. Boo! If you're interested in viewing more of our Hong Kong photos, click through this slideshow. We absolutely loved Hong Kong. We did so much in the 4 days we were there and we were exhausted and broken by the end of the trip but we had the best time. I wish we'd had a little longer as there were still some things we wanted to see and didn't get a chance to, such as the Big Buddha and Dragon's Back but we loved all of the things we did and experienced. Look out for more detailed posts about Hong Kong coming soon. Have you been to Hong Kong? What did you like? What did you hate? What surprised you? Let me know! I knew you were going soon - I thought you were going the week before me than when I didn't see any posts about it I assumed you had changed your mind. Can't wait to read all about it!